Welcome home, Ben Affleck - all is forgiven. Yes, even "Gigli." In adapting Dennis Lehane's 1998 crime thriller "Gone Baby Gone," the Hollywood star has gone behind the camera and rescued his career from the water-cooler ridicule that has dogged it since the days of "Daredevil" and J.Lo. The joke's on us, it turns out; as a director, Affleck has come through with a sharp, morally ambiguous piece of pulp crackerjack. More impressive, even unique, is the way this local boy uses Boston - the mythic, clannish Boston of writers like Lehane and the late George V. Higgins. "Gone Baby Gone" is a straight-up genre film whose plotting sometimes prompts disbelief and whose dialogue turns to agonized speechifying toward the end. Yet it's anchored throughout by an insider's knowledge of this particular street, that specific turn of phrase, this local actor cast in a key bit part. The sag of a three-decker and the sag on the faces of the people who live there. "Mystic River" and "The Departed" may be the better movies, in other words (although in the case of "Mystic River" I'm open to argument), but "Gone Baby Gone," which opens Friday, is by far the better Boston movie. As in "River," a missing child galvanizes the action. This time the victim is a 4-year-old girl, Amanda McCready, and her mother is anything but camera-ready. This doesn't stop NewsCenter 5 and its competition from descending like locusts on the Dorchester side street where Helene McCready (Amy Ryan) lives, the better to snap up prime-time footage of the grieving mom. Even in this early scene you can see what Affleck's getting right: The faces of the neighborhood women are shut down tighter than a storefront security gate. Patrick Kenzie (Casey Affleck) and Angie Gennaro (Michelle Monaghan) aren't intruders, but they're still viewed with suspicion. Private investigators and lovers, the two are hired by Helene's busybody brother (Titus Welliver) and sister-in-law (Amy Madigan), who in short order inform the detectives that Social Services would have taken Amanda away long ago if anyone considered it the city's business. The cops are on the job, but Patrick and Angie know people in the neighborhood who don't talk to the police. Reluctantly, they join the investigation; just as reluctantly, the two detectives working the case accept them. Ed Harris as Detective Remy Bressant and John Ashton ("Beverly Hills Cop" and "Midnight Run" - where has this bulldog been since then?) as his partner, Nick Poole, are more familiar crime-movie fixtures, but both actors bring a weary specificity and eyes that have seen it all. The further everyone digs into Helene's immediate past, the more it stinks: a Haitian drug lord (Edi Gathegi), a bag of missing money, a tortured corpse in Chelsea. "Gone Baby Gone" takes place in the urban cracks where the roaches and the rats live; more than once, the characters leave a bar and you're shocked to discover it's still high afternoon. When a city's worst impulses are hidden from sight, you have to know the terrain to find them. This is where Affleck's inner map serves him well. Would another director, one from out of town, have filmed a scene set at the Quincy quarries at the Quincy quarries? Does geography matter if you're not from around here? It does. The Boston in this movie coheres as a town deeply lived-in, with roots so deep and so tangled they can surface miles away - in a quiet suburb, perhaps. Yet those connections are all that make sense of the place, especially since no one's talking. Lehane knows the class and ethnic divisions that balkanize the Hub, and Affleck captures them in a neighborhood kid's vulgar taunt or the flat, cold-fish stare of Helene's friend Dottie (the remarkable Jill Quigg, late of Southie's Old Colony housing projects). 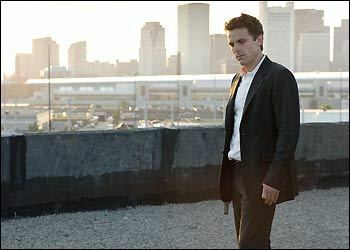 That authenticity goes a long way to making "Gone Baby Gone" work when the plot twists start curling beyond the pale. Even the accents are unobtrusively dead-on for the most part; the way Ryan unprintably describes a smell in a certain apartment should win her an award from the South Boston Citizen's Association. The actress's larger triumph lies in letting us see damaged maternal love hiding beneath the skin of a hateful woman. This is the stuff supporting actress Oscars are made of. Affleck's not certain what to do about race, though - he is from these parts, isn't he? - and white characters in the book have been cast with black actors (Gathegi, Morgan Freeman as a police captain) in ways that don't feel entirely organic to the tale. Yes, we're a more modern, cosmopolitan city than Lehane and "The Departed" indicate; no, Southie is not now nor ever has been all mook. And, yes, we're still chained to our ghosts. When the great Boston movie is finally made, it will deal with class and race and the past, and no one here will want to see it. That said, "Gone Baby Gone" gets tantalizingly close. I'd never stopped to consider Casey Affleck as a movie star before, but under his big brother's tutelage, he blooms as a leading man of richly watchable savvy and intelligence. Purists will kick, since this Patrick Kenzie is nothing like the hero of Lehane's four novels: young rather than touched by middle age, slender instead of bulked up, a bit of a yuppie. Above all, Patrick is a neighborhood kid who grew up and out, who lives among the clan but has his eyes fixed on the horizon. He dresses well; he reads books and people. It's the specific plague of this city to not trust native sons who are "better than they should be," and nothing brings the wrath of a townie down faster than perceived superiority in another person. "I remember you from high school," Dottie tells Patrick before dropping the hammer. "You're still conceited." You think the director knows something about this? Being "from here" is both a scar and a badge of honor, and you don't throw it over for preppie shirts or Hollywood superstardom without paying a price. It's a complicated thing, this Boston tug-of-war between belonging and ambition, and "Gone Baby Gone" worries at it like a metaphorical bone. "You must think you're more from here than me," the New Orleans-born Bressant tells the hero. "But I been living here more than you been alive. So who's right?" Who's right: The question hangs over the movie like a curse. In its final scenes, after most of the bodies have been cleaned up, "Gone Baby Gone" expands its line of inquiry into a painful moral dilemma that pokes the bruise of class one last time. Is being part of a family, a neighborhood, a city worth the scars they can leave? The answering's easy. It's what you do with the answers that's hard. Ty Burr can be reached at tburr@globe.com. For more on movies, go to boston.com/ae/ movies/blog.